The Titans of Steel: Warring Suns universe is a future where the main fighting unit is the Titan Attack Tech, better known as the Titan-AT. Titan-ATs are generally humanoid in appearance, range from seven to fifteen meters in height and weigh as much as 200 tons. A Titan-AT can have an array of weapons including lasers, auto cannons, missile launchers and other specialty weapons and defensive systems. 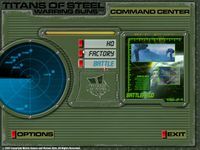 Titans of Steel: Warring Suns allows you to design or reconfigure your own Titan-AT. There are 450 different Titan-AT types to start with, including 150 pre-designed Titan-ATs. Each Titan-AT has over 74 internal systems, electronics systems, 4 armor types, 20 chassis styles, 5 size classes (recon, light, medium, heavy, assault) and 29 weapon types ranging from conventional to exotic. Once you've settled on your perfect Titan-AT, you can share your design with other commanders. Titans of Steel: Warring Suns is more than a combat game. It is also a fully open ended role playing system designed to allow you to choose between eight different race and gender combination. All your pilots have a full statistics sheet and earn experience points. These experience points can be used to increase 7 attributes and 19 skills. Your pilots can go up in rank and will benefit from additional training. They are assembled in squads, which can have 8 pilots and up to 16 Titan-ATs. The battle area has four map sizes ranging from small to huge. Interactive terrain features, including flammable forests and smashed buildings, make the battlefields more dynamic. You and your squads will battle over different map types such as Terran, Savannah, Polar, Core and BioChem. You can play skirmish battles on random maps as well as pre-designed campaign missions. Random map parameters can be defined for even more challenging battles. An auto-move feature allows you to concentrate on your weapon systems. Multiplayer support allows up to four players with thirty-two Titan-ATs to compete in Hot Seat, LAN or Internet games.